WhatsApp has announced new features on the application recently and one of these new features was about account verification. Now, companies and business owners can get “Verified Business Account” from the application, so they can provide more professional and more official support for their customers. Devs already has announced that these accounts will be limited since it is still at pilot mode at the moment. We are going to tell you how to get one of these accounts for you on here. What is Verified Business Account? 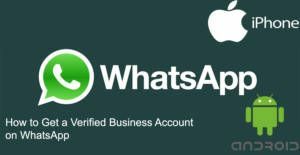 You will need to contact to WhatsApp for getting verified account and you will need to give detailed information on your company and your phone numbers that you use. You can also send business inquiries to WhatsApp with bd@whatsapp.com. You will need to mail this address or support@whatsapp.com and give the information that we have told you above. Your application will be reviewed by the staff and they are going to respond you. This feature of the application will help your customers to contact you with faster ways. WhatsApp will confirm that you own the company and will give a green badge to your account. People will able to block you if they want to… So we recommend you to not to disturb people with advertising messages much. This will be similar with blocking an ordinary account on the app. If you have any questions about this service, you can comment this page, ask us through our Q&A service or join our community.